A sketch of Medan City. Click the link or the image to see the map. Medan is the main entrance place for travellers in Sumatra. It is so nice like a blow with a hammer on the forehead instead of having breakfast. The metropolitan region of the city inhabits more than 6 million people, maybe far more - who exactly knows that? The megacity is defenitely overcrowded, dirty, ugly, extremely noisy and everything looks very run-down. Besides it's not the safest place. However, even arriving with the firm intention to flee the place as quick as possible it is usually not to avoid having an overnight in Medan until one can leave the cursed monster on the first bus next morning. Reachable from Medan are three main destination who are all very worth to be visited: that's, above all, magnificient Lake Toba with it's fantastic, volcanic mountainous landscapes, it's Bukit Lawang with it's jungle surroundings and the orangutans and Berastagi, a former Dutch hill station in the Batak Karo Highlands. All these rapidly urbanising villages, towns and megacities are looking like the skin cancer of the earth. 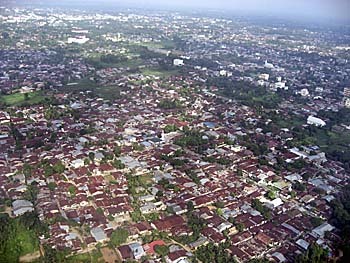 Medan does not look any different than so many smaller places in Sumatra, it's just much, much bigger. A conglomeration of many villages who grew together. Medan's population consists of a colourful ethnic mix of Batak People of different tribes, Acehnese from north Sumatra and other Malays, Minangkabau, Mandailing, Javanese, Sundanese, Chinese, Tamils and some Sikhs from India, some Arabs and other ethnic minorities including a handful Westerners. Demographic says that the Javanese are meanwhile the largest ethnic group here, followed by (ethnic) Chinese. It's either the third- or fourth biggest city in Indonesia (following Jakarta, Surabaya, Bandung) and defenitely the largest city in Sumatra, before Palembang. A walk through parts of the city reminds to the penetration of an active battlefield. There are barely sidewalks, and if, they are mostly blocked with dirty crap of all kind. The streets are full of dust (or more often slippery, oily mud) and rubbish and crowded with vehicles who's drivers take safety easy and risk a lot for nothing. One has to bypass obstacles over obstacles and frequently to walk on the street. The smog is terrible and the risk to be hit by a vehicle big. An alternative is to take a becak (motorbike rikshaw) or a taxi (what makes one an active part of the traffic problem). However, walking is still the best method to explore a place. Besides, Medan is a rainy place all around the year. Only in the months from July to October the rain is less frequent. It's a typical weather for the tropical rainforests and swamps who coined the landscapes in the past. Nowadays most of the plains in Sumatra have been logged and changed into palmoil and rubber plantations. Tobacco is still growing around the megacity as well. Accommodation is concentrated in the neighbourhood of Masjid Raya on Jalan Sisingamangaraja (short: SM Raja), one of the main roads. 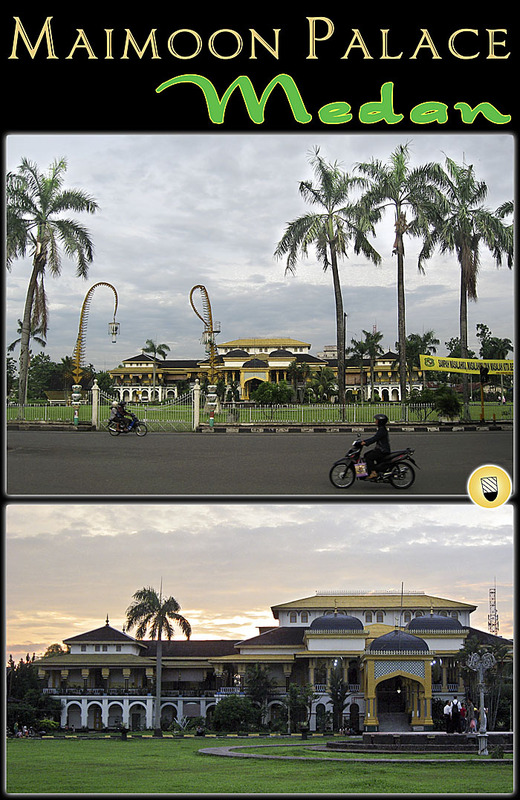 Somewhat north of it is the city center, while the historical center is around Freedom Square (Lapangan Merdeka). A map of Medan. It covers most of the city's center. 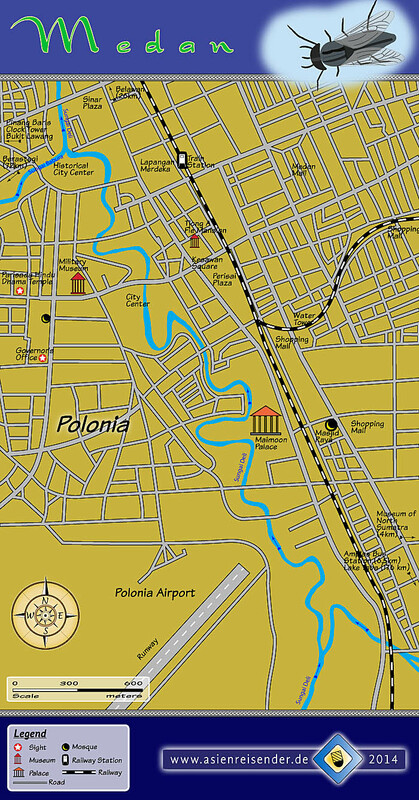 'Polonia' refers to the former plantation property of a Polish farmer; later it became the name of a part of the city and the airport's name as well. Medan's history dates back to the time around 1590 CE. It's not clear if the first settlement was a Karo Batak village or a Malay place. The first settlement was located at the confluence of the Deli and the Babura Rivers. In a Portuguese record of a merchant from Malacca it's written that the name Medan is derived from the Arabic 'holy' city of Medina. Another interpretation of the name's root is the Indian Hindi term 'Maidan', what means 'land' or 'ground'. It's supposed that the place was inhabited by a mix of different ethnics from it's early history on. It was under the rule of the Malay sultan of Deli and came a few years later under the new rule of the sultan of Aceh in 1612. It seems that the sultan of Aceh seized power over Medan by sending troops to conquer it. There was also a battle in Medan in the end of the 17th century. Sumatra came more and more under Dutch control in the 19th century. It was from the 1860s on that Dutch farmers started to clear the surrounding plains and drain the swamps for the cultivation of tobacco. With the opening of the Suez Canal (1867) the transport way to Europe became much shorter and faster. 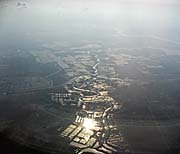 Medan started to grow as a commercial center of the region. Medan was declared the capital of north Sumatra in 1915 and it's growth included the construction of a number of representative villas for the Dutch merchants and colonial officials as well as governmental buildings. These now historical buildings gave Medan a distinctive character. In this time the place might have been quite attractive, apart from the hot and humid climate, with broad streets and cafes to sit and rest. Though, nowadays the old heritage is treated miserably. As in many places in Southeast Asia the old buildings get more and more demolished for the sake of ugly concrete boxes who are shopping malls, office buildings or merely garages for all the masses of dirty, stinking cars who are so beloved by modern man and destroy the whole planet. A small oasis in the asphalt desert: Maimoon Palace (also: Istana Maimun). Built in the years 1887-91, it served for a time as the residence of the sultan of Deli and it's nowadays a tourist destination. The palace combines style elements of Malay, islam, Indian, Spanish and Italian origins. Although it's not the Alhambra, it's still a building or remarkable aesthetics. Some of the older buildings are the remarkable Great Mosque (masjid raya, built 1906), the sultan's Maimoon Palace (1887-91), the old Dutch City Hall (built 1908), the Central Post Office, Titi Gantung (a railway bridge), Tirtanadi Water Tower (built 1908), Sri Mariamman Temple (a Hindu temple, built 1881), Tjong A Fie Mansion (a mansion of a Chinese Hakka merchant, supposedly a cousin of Cheong Fatt Tze of George Town, Malaysia, completed in 1900), Medan Cathedral (a catholic cathedral, 1928) and Vihara Gunung Timur (a Chinese taoist temple, built 1962). There is still a dwindling number of old Dutch houses in Medan, very run-down. Medan's main mosque, Masjid Raya (1906). It's a large building on a large area. On holidays like ramadan the service is produced by at least a thousand loudspeakers into every direction. It lasts very long (hours) and is that noisy that nothing else is anymore to hear. The regular prayers are 'broadcasted' additionally, everybody's darling is the 5 a.m. prayer. Since there are many hotels, guesthouses, restaurants and bars in the close neighbourhood, it's difficult or impossible to escape the noise. The ferry service between George Town/Penang in Malaysia and Belawan, the port city of Medan, has been ceased in June 2010. The only way to travel to Medan is now exclusively by airplane. However, the old Polonia Airport has been closed for public use in July 2013 (it's a military airbase now). 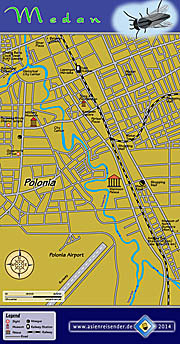 Polonia was still half-way comfortable because it is located in the city center and of a small size. The new Kuala Namu International Airport (KNO) is a postmodern monster some 30km outside of Medan. It's the second biggest airport in Indonesia now, following Jakarta airport. That makes travelling to Sumatra even more complicated and expensive - additionally to the expensive visa fee and flight ticket and additional transport to/fro the airport there is an airport tax charged. Not to mention the time loss of the inefficient transport system, all the inconveniences and the annoying and paranoid security checks (we all are potential terrorists now! ).